With music from Italy, Bulgaria, Turkey and Greece. 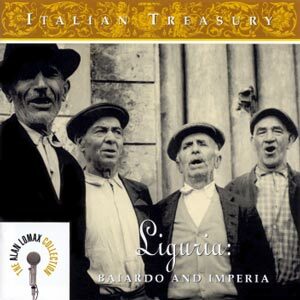 Liguria: Baiardo and Imperia from The Alan Lomax Collection. Historical recordings by Alan Lomax (from 2002), with the spectacular vocal polyphony of western Liguria (Italy), a region of ports and mountain towns, rich in folkloric traditions. This CD contains sung stories, including selections from the remarkable ‘A barca’ ceremonial ballad cycle of Baiardo, as well as instrumental dances from the port city of Imperia. In 1954, Alan Lomax and Diego Carpitella embarked on a one-year voyage of discovery that resulted in extensive documentation of Italian folk music. It was a mythical time. Thraki – Thrace – the Paths of Dionysus of the Rodopi Ensemble. Thraki is a collection of eleven traditional ‘Thracian’ songs and dances performed by violin, clarinet, ‘kanun’, lute and voice performed by Drosos Koutsokostas. The sound of the Ensemble Rodopi is characterized by the use of traditional percussion. The Ensemble is deeply connected to ‘Thrace’, a unique geographical and historical triangle in Southeastern Europe, consisting of South Bulgaria, Northwest Turkey and the northeastern point of Greece. The name Rodopi Ensemble is directly inspired by the ‘Thracian’ mountain range ‘Rodopi’, which is 240 kilometers long. CD. Thraki – Thrace – the Paths of Dionysus – Rodopi Ensemble. Label: Arc Music (2018-2019), code: EUCD2822.